Rangers striker Jon Daly insists the players must raise their game to ease the pressure on manager Ally McCoist. 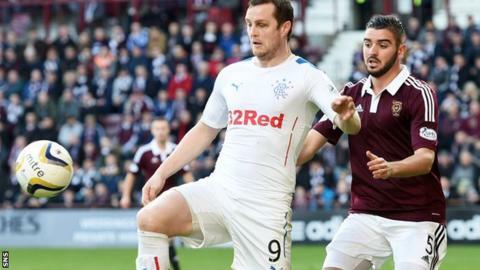 The Ibrox outfit lost 2-0 to Hearts at the weekend, leaving them nine points behind the Tynecastle side in the Championship title race. McCoist received flak from some Rangers fans during the game and Daly said: "The players must take responsibility, once we cross the white line there's nothing the manager can do. "It's up to us to get results." The abuse aimed at McCoist was heard when he took off midfielder Lewis Macleod in the 80th minute, with Rangers 1-0 down, although the chants were quickly drowned out by support for the Ibrox boss. Hearts had taken the lead through Jamie Holt's strike, after Steven Smith was sent off for Rangers in 21 minutes for a reckless challenge on Callum Paterson. Jamie Walker sealed the win with a late penalty to leave the league leaders in a strong position to secure the title. And Daly reckons the Rangers players need to step up as they look to close the gap on the Tynecastle side. "The manager can't do anything about the sending-off, it's something you have to adapt to," the Irishman added. "It's up to the players to make sure we win games for him and at the moment we are not doing that." Hearts remain unbeaten in the league but Daly retains hope that they can be caught. "It's going to be tough, no doubt about it," he added. "That's nine points and we only have two games against Hearts left, so it's out of our hands. "It's Hearts' to lose but we need to concentrate on ourselves. We have lost points we shouldn't have and we need to make sure that stops. "But I think there's still plenty of twists and turns to come and we need to try and close that gap as soon as possible. Hopefully if we do that they will feel a bit of pressure and drop a few points."